Industrial districts can be conceived as complex systems characterised by a network of interactions amongst heterogeneous, localised, functionally integrated and complementary firms. In a previous paper, we have introduced an industrial district computational prototype, showing that the economic performance of an industrial district proceeds to the form through which firms interact and co-ordinate each others. In this paper, we use such computational framework to experiment different options of 'local institutional engineering', trying to understand how specific 'supporting institutions' could perform macro-collective activities, such as, i.e., technology research, transfer and information, improving the technological adaptation of firms. Is a district more than a simple aggregation of localised firms? What can explain the economic performance of firms localised into the same space? Could some options of 'local institutional engineering' improve the performance of a district? Could such options set aside the problem of how firms dynamically interact? These are questions explored in this paper. Our paper is focused on these main questions: why firms of an industrial district can perform better than isolated firms? Is a district more than a simple aggregation of firms located into the same geographical space? What can explain the economic performance of an industrial district? How some "local institutional policies" can support the adaptation of the district towards the external environment (market and technology)? To answer to such questions we suggest the use of agent-based computational techniques. For "computational techniques" we mean a computer-based way of formalising evolutionary interacting agent-based models. Such techniques allow the modelling of heterogeneous and localised agents which interact directly through decentralised mechanisms of interdependence, give rising to forms of collective evolution (i. e., see: Axelrod 1997; Axtell 2000; Durlauf and Young 2001; Gilbert and Doran 1994; Gilbert and Terna 2000; Lane 1993; Terna 2001). 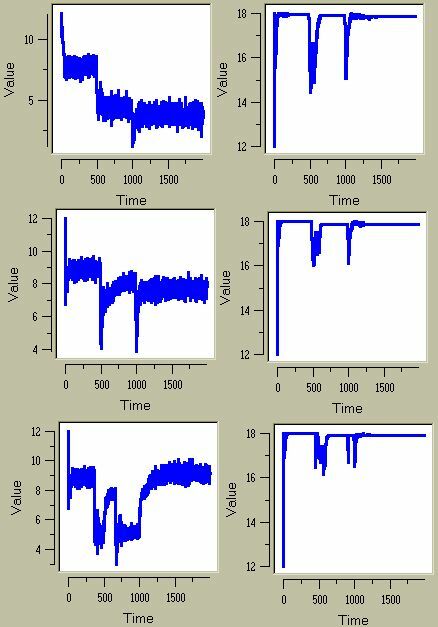 Through a computational formalisation of an industrial district, we are able to explore the problem of dynamics and collective phenomena emerging "from the bottom-up", starting from micro-founded specifications which describe the behaviour of firms within a context of interaction (Epstein and Axtell 1996). Our idea is that the agent-based computational modelling is a powerful tool to picture fundamental processes which are hidden inside the organisational mechanisms of an industrial district, because it allows to avoid the trap of focusing the observation either just on "pure" individual level, as though the district were simply composed by "isolated" firms, or just on the aggregate level of the "system as a whole", as though the district were a centralised structured system. Our computational approach needs to be theoretically related to the new "research agenda" of evolutionary economics, which is based on three strong ideas: "dynamic, first! ", need of a micro-foundation of macro-collective phenomena, and study of so-called "emergent properties" (Dosi 2000). With respect to our specific field of research, our approach needs to be related above all to the new "cognitive and evolutionary" approach to districts, which seems to tear itself away from the traditional static "marshallian" approach (i.e., see: Belussi 1996; Belussi and Gottardi 2000; Lane 2001; Lissoni 2001; Pilotti 2001). As it is stressed in a previous paper (Boero and Squazzoni 2001), speaking about a "prototype" industrial district it means to translate an "ideal-type" of district into an agent-based computational model. We have identified several "building blocks" able to reproduce the organisational mechanism of the district, trying to sketch different "experimental settings" able to improve our understanding about the link between economic performance of firms, structure of inter-firm relations and options of "local institutional engineering". A possible answer to questions mentioned above (district vs. isolated firms) comes to some recent macro-statistical surveys on Italian industrial districts, which try to measure the so-called "industrial district effect" (see, for example: Signorini 2000). Such surveys dis-aggregate data on the level of performance between "isolated" firms and firms located into an industrial district. They show that the so-called "industrial district effect" matters for firms, and threfore that firms agglomerating into districts achieve higher level of performance than "isolated" firms. Unfortunately, such statistical surveys seize the "macro-aggregation" nature of data, but they cannot explain the mechanisms underlining the "district" phenomena. Our answer starts from a modelling of a prototype industrial district and from the creation of different "experimental settings", allowing us to compare a first district, conceived as a "market-like structure", to say a simple "localised" market of aggregating firms, to a second district conceived as a "partnership structure" of firms, to say a more integrated system. As it will be outlined below, the comparison amongst such settings shows some interesting issues concerning the relation between economic performance of firms and structure of their relations. As it will be outlined below, the outcome of our simulation shows that differences in the simulation outcome of these settings are related to the problem of how firms interact and which kind of inter-firm network emerges (i.e., unstable vs. stable; schizophrenic vs. co-ordinated). The answer to other questions mentioned above ("local institutional engineering" and performance of district) is that, remaining within a traditional structure of the district (to say excluding some options for firms, such as the possibility to decentralise or internalise production chains), the competitiveness of the firms and the evolutionary adaptation of the system, in respect to a deeply changing technology and market environment, can be sustained by a well-focused "local institutional engineering". There is a relation between the presence of "well-acting" institutions, with functions of producing specific collective resources for the district and the reduction of the so-called problem of efficient sizes of firms (Bianchi and Giordani 1993). In our paper, we show different options of "local institutional engineering" and we observe their impact on the system. The outcome of the simulation shows that the "local institutional engineering" needs to be weighed on specific collective weakness of the system, but it even shows that the structure of inter-firm relations and the patterns of behaviour undertaken by firms matter again. The paper is organised as follows: first of all, we describe the structure of the prototype; then, we summarise the outcome of two foregoing experiments, presented in our previous paper; therefore, we describe different experimental settings of "local institutional engineering"; afterwards, we show the outcome of the simulation cycles and we compare the data, on the basis of some specific indicators able to show the dynamics of the model; finally, we sketch the conclusion concerning the question posed in this introduction and the possible development of the prototype, and we show a sensibility analysis of parameters we introduced. With respect to our computational prototype, our hope is above all to suggest an artificial "ideal-type" of industrial district able to be easily developed in prospect, both in a theoretical and in an empirical sense. We start from a very common definition of what is an industrial district: an industrial district can be viewed as an "evolving network of heterogeneous, localised and functionally integrated firms which interact in order to produce a good on the market". Such definition can be well grasped if one thinks about the program of research on the "complex adaptive systems" yielded by the Santa Fe Institute (Anderson, Arrow and Pines 1988; Arthur, Durlauf and Lane 1997). In fact, in our opinion, an industrial district shows all that "properties" or "distinctive phenomena" which are regarded as "complex adaptive systems fundamentals": aggregation, non-linearity and interaction amongst heterogeneous agents, distributed control and information flow, decentralised intelligence and information processing, localised learning, diversity of behaviour patterns, capacity of innovation, complex relationship between adaptation at the individual level and evolution of the system level, structures as processes, and so on (Auyang 1998; Holland 1995, 1998; Lane 2001). This is the reason why we think that the language of "complex adaptive systems" could be viewed as a good analogy for the "language" of industrial districts, and consequently that the agent-based computational modelling can be an useful tool to study such phenomena. In our prototype, we assume that firms are the agents of district. They control three levels of information (resources, performance, technology). Monitoring them, they undertake their course of action. Their goal is to improve their economic performance, making investments on their technological assets. Acting in the prototype, there are a class of 100 final firms, having functions of organising the production and selling goods on market, and three classes of 100 sub-contracted firms respectively, having specialised functions related to the whole production process. According to the structure of division of labour amongst firms and the related segmentation of the production process which characterise the organisational mechanism of a district, the prototype is composed by 400 firms which are localised into four different "core activity" levels of specialisation. It is known that if one looks inside the industrial district "black box", the first thing leaping to the eye is the integration of different firms working to different but interrelated "segments" of the same production process. We assume that our "ideal" district holds every specialisation and every competency needed to produce its "typical" good. The firms are integrated by means of production chains which need to be conceived as inter-organisational channels connecting firms. The firms interact directly along production chains, because they are complementary and functionally related, that is to say, they need the competence of specialisation embodied in the other firms. In our prototype, we assume that a production chain needs to be composed by a final firm and a team of three sub-contracted specialised firms. Every final firm needs an heterogeneous team of three sub-contracted firms in order to sell the final product on market. Every sub-contracted firm needs a final firm to sell its part of product/process. The principle regulating interactions is that during any cycle of simulation, every agent can produce and sell just one product, therefore taking part to just one production chain. Any simulation cycle executed by agents is a production cycle executed by firms. The final firms are the "central players". They receive orders directly by the market and they move inside the system as "organisers of the production", aggregating sub-contracted firms to form a production chain. The evolution of the technology and market environment is conceived as the selective mechanism impacting the firms of the district. We have modelled the evolution of the external technology and market environment and the dynamic relation between market requests and production technology features embodied by firms. Over 2000 cycles of simulation, our prototype is affected by a transition of three different "technological regimes" (T1, T2, and T3), with growing production cost sustained by firms and growing performance shaped by the market (see Figure 1). The evolution of market and technology is exogenous, as though it were fixed outside by an external "standard". The constraints of market give rise to the evolution of the space of possibility which characterises the technological options of firms, defining the level of profitability over time. In a "demand-side" approach, the market needs to be conceived as an institution "collecting information" about technological possibilities and requirements of customers. The firms of the district need simply to adapt to this "standard" evolution (for details, see: Boero and Squazzoni 2001). Figure 1. The evolution of the technology and market environment: τ is the number of the cycles of simulation. T1, T2 and T3 are the three available technological regimes over time. The coloured areas define all the possible technological positions of firms in respect to the technology standard evolution, and all the related levels of performance which firms can achieve over time. Obviously, technological evolution is conceived as an irreversible process. According to some well-known ideas about how to model dynamically the technological learning of firms interacting within a system (Ballot and Taymaz 1997, 1999; Carlsson 1994; Carlsson, Eliasson, and Taymaz 1997; Eliasson 1991), we assume that all the three technological regimes are composed by a set of four "technical factors", which represents the "internal asset" of a firm and its technological position in respect to the technological trajectory fixed by the exogenous standard. Such factors allow us to model the incremental nature of the technological learning. We have modelled a set of technical learning factors as a combination of number to reach, from 0000 to 1111 ("best practice" level), inside all the three technological regimes. Those combinations of numbers represent all the possible combination of production factors that firms need to discover. For simplicity, we take into account only five possible combination of factors. When a firm absorbs a new technology, it gradually starts to search for the level of best technical practice (1111). Firms do not know all the possible combinations of factors-numbers. Step by step, they try simply to explore some changes into their combination of factors. If a "technological regime" can be conceived as a "specific form to organise the production process" and if the goal of a firm is to improve the performance of its product, then, the strategy of a firm is, first of all, to embody technology into its organisational asset, and then to reconfigure and adapt its organisational resources (physical and human) to the change, through a phase of learning process based on "well-oriented investments". The evolution of the combination of factors-numbers mentioned above, namely the evolution of the internal asset owned by firms, could be viewed, in a metaphorical way, as micro-organisational changes, such as, i.e., formation of new professional capabilities, re-engineering of production processes, and so on, needed in order to improve the "positive" effect of the technology adoption (Tulzemann 2000; Verspagen 2001). We have modelled three phase of technological learning that a firm needs to undertake, as in the Figure 2. The course of learning is modelled as a cycle characterised by a first phase marked by the technology absorption, a second phase marked by the technical learning process, and, finally, a third phase marked by the saturation of a given technological option. Over such phases, the firm develop what Cohen and Levinthal call "absorptive capacity" dynamics, in respect to the technology and market environment (Cohen and Levinthal 1990). To regulate such operations, we have introduced a matrix called "TechMatrix" (Figure 3) based on a function which gradually increases over time the levels of cost and performance for firms, according to the idea that the evolution of technology and market is marked by a gradual development from less to more complex technology and from low to high-quality market requirements. This Figure shows the "TechMatrix". This matrix shows data concerning the relation between technology and learning. Through investments of resource, a firm takes a position within such matrix. The evolution of technology (T1, 2, and 3) is characterised by growing costs and growing values of performance. The relation between costs and performance is regulated by means of a function which gradually increases, according to the same evolutionary dynamic characterising the market. Inside all the technological regimes, there are five steps of learning (from 0000 to 1111), with cost and performance which follow the same "gradual increasing function". The column A shows the increasing cost of technology based production, for all the possible learning steps undertaken by the firm. The column B shows the achievable level of production performance of the firm. The third one shows the decreasing costs concerning the use of the same combination of production technological and technical factors (to say, when a firm stays in the same position within the matrix) for more than one cycle. Such decreasing cost is modelled according to the idea of increasing returns due to learning by doing and using (Arthur 1994). The most important indicator of the performance of a firm is the technological asset through which it produces its product. 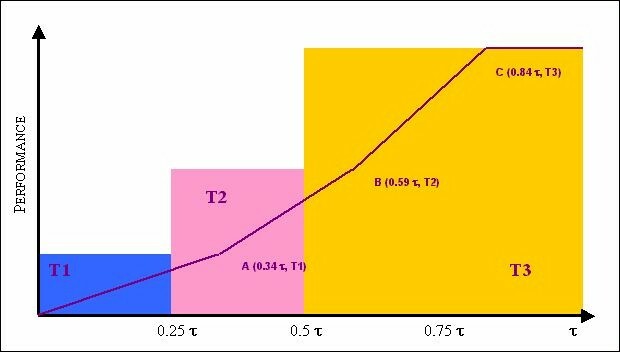 If pp is the performance of a firm and T1, 2, and 3 are the technological regimes affecting our prototype over time, then: ppT1< ppT2 < ppT3. But, at level of the production chain, the value in terms of performance of the final product, to say the "total" performance of a chain, is not a simple sum of the individual performance of the firms, which take part to the same chain. The principle is that more a production chain is technologically homogeneous and compatible, namely more it is composed by firms having the same technology-based production asset, less frictions the whole production process can find, more quickly the product can be placed on market and more "profit" it can produce. The idea is that the different parts of the same segmented production process of a chain need to be integrated through the work of final "assemblage" undertaken by final firms. This is a phase during which the degree of compatibility amongst the technological features of the interacting firms becomes very relevant. Indeed, we introduce the principle that more a chain is based on firms which are technologically compatible, more it can benefit from competitive advantage in terms of "time compression" of the production. In the computational code, we have introduced two functions called "time compression" and "mrtc" which regulate such task. The first one assigns a "premium", on the ground of the degree of "technological" similarity amongst firms of a chain. The second one multiplies increasingly the value of such "premium" over time, according to the statement that the technological evolution is irreversibly characterised by growing costs and growing levels of performance. Such functions give to final firms, which place quickly the product on market, a "final profit", which emerge by production chain, and which can be capitalised by them in terms of additional resources. Different ways to manage such resources will be a standpoint for the experimental settings introduced below. Finally, the mechanisms of interaction are as follows: whenever a final firm selects its sub contracted firms, everyone (sub contracted and final firms) puts its part of investment in order to produce the "final good" placed on market by the final firm, with a given aggregation of technological features and consequently a given level of "aggregate" performance. 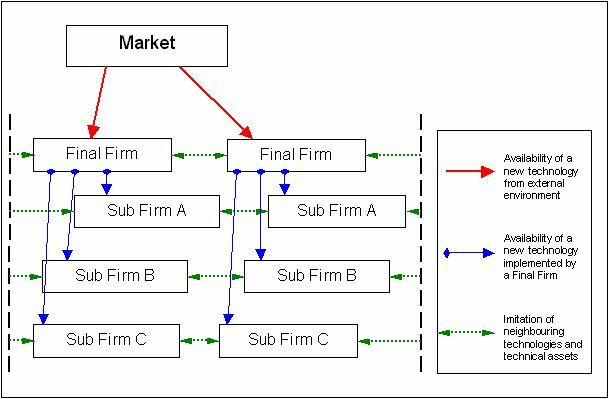 If the product is absorbed by the market, the final firm pays the interacting sub contracted firms for their part of individual performance. Otherwise, everyone (also the final firm) looses the production cycle and the investment. Firms are embedded into a topology of spatial and organisational relations of proximity. We assume a "double axis" of proximity. The first one is an "organisational" axis, namely the proximity which connects firms interacting directly "face to face" along the same production chain. The second one is a "spatial" axis, namely the proximity which connects "neighbouring" firms that are embedded into the same "core activity" level of specialisation of the system. We assume that the different levels of specialisation are like "sub-clusters" of localised firms that are embedded into the same space. In short, we assume a total degree of correspondence between "spatial" and "social" metrics of the proximity. Spatial proximity is conceived as a "locus of social proximity" of firms. It allows a quick access and exchange of information and a continuos possibility of mutual monitoring amongst firms. According to the literature on industrial districts and clusters, this is the secret of the original mix between competition and co-operation which characterises such systems, and the famous question of how knowledge externalities can locally grow up (Brenner 2001; Cooke and Morgan 1998; Dei Ottati 1994; Malmberg and Maskell 1997; You and Wilkinson 1994). In our prototype, we have introduced a "neighbourhood set" which regulates the relation of proximity amongst firms. The "proximity function" is implemented using "arrays" which regulate the mutual positions of firms, inside every class or sub-cluster. For every firm, the "neighbourhood" is composed by the two firms that are located at the right and the left along the same array. We assume that a firm can always monitor performance values of its neighbouring firms, looking at their technology assets, namely their combination of technical factors (combination of numbers). We assume that, if a firm discovers that the performance of a specific neighbouring firm is higher than its own, and that there are differences into their respective "technology features", then it can adjust its own technical combination, imitating the technological assets of the neighbouring firm. In practice, the firm adds into the combination of numerical factors (i.e., 0101), which represents its internal asset and its technological position, the new "1" which it discovers looking at the other neighbouring firms, to say reading the string of numbers of the neighbour and stopping to the first difference found (i.e., 0111). Clearly, such "neighbourhood relation" is mutual and bi-directional and implies costs regulated by the "InfoMatrix" (Figure 6). Finally, the relation of "organisational" proximity amongst firms are "time-varying", according to the dynamic of formation of production chains and the possible mix of interacting firms, while the relation of "spatial" proximity is stable over time (see for details: Boero and Squazzoni 2001). But, how information circulates from the environment to the system, and within the system from firm to firm? Because of the different types of firms (final firms and sub-contracted firms), the different types of functional competencies embodied by the firms, and the specific division of labour characterising the district, we assume that the final firm is the real strategic agent inside the prototype. A final firm is able to translate the inputs coming from the technology and market environment into "relevant" information for the other interacting firms. The function of a final firm is to receive information from market, to move inside the system aggregating a team of sub contracted specialised firms, to organise a production chain, and to distribute information about the technological environment to the other interacting firms (see Figure 4). from final firms to market. an imitation by external exploitation, namely the inter-firm technology imitation based on relevant information coming from the "neighbourhood set" mentioned above. In order to regulate the cost of actions of firms, we have introduced what we called the "ChangeMatrix" and the "InfoMatrix" (see Figure 5 and 6). We assume that every action undertaken by firms can be transformed into costs and parameterised into such matrices. The structure of costs showed into "ChangeMatrix" and "InfoMatrix" follows the same "increasing function" which characterises the evolution of technology and market, as in the case of "TechMatrix", mentioned above. The "ChangeMatrix" shows the information cost needed to implement a new technology (first line) or to improve the internal technical assets of a firm (second line). For example, they can be viewed as a cost to purchase new production machines or as a cost to adapt the organisational asset of a firm to the change (for example, think about the training of "human capital" needed to sustain the technological processes of innovation inside a firm, and so on). Along the column, there are all the three technological regimes impacting our artificial industrial district over time. The case T3 causes the end of the simulation. In this situation, firms haven't any possibility to make another technological jump. They can only improve incrementally their technical asset inside T3. This Figure shows the "InfoMatrix". It contains the cost which final and sub firms must pay in order to achieve different types of information. Information concerns technological and technical asset of "neighbouring" firms (those located inside the own "array") and technological exploration inside the environment, both external and internal. The first two lines show the cost of imitation concerning technological and technical assets implemented by two neighbouring firms. It is a matter of a cost concerning the acquisition of knowledge about technical characteristics of the neighbouring firms. The data in line number three and four are the cost concerning the information about a new available technology, the recombination of technical factors during technical learning, or the implementation of a new technology undertaken by the firm, looking directly at external environment. Innovation cost is higher that imitation cost, because of the need to explore directly the environment, without the advantages deriving by the externalities coming from the internal environment of the district. The last line shows the cost of information which final firms must to pay in order to find the best sub contracted firms available inside the district, in order to organise a production chain. Previous Experimental Settings: Structure and Outcome. As it is shown in our previous paper (for details, see: Boero and Squazzoni 2001), the first experimental settings compare the same district with different structures of interaction, namely different agent-based rules of behaviour and different mechanisms of inter-firm co-ordination. According to some ideas suggested by North (1990), we explore different "institutional mechanisms" able to regulate inter-firm relations, namely different "generalised patterns" driving the behaviour of firms, observing how such differences can more or less affect the economic performance of firms and the technological evolution of the system. The first experimental setting is called "one-shot interacting firms". The system is a kind of "market-like structure", as though it were a simple localised aggregation of firms. The economic inputs are the driven forces which underline the behaviour of firms and their patterns of interaction. We introduce "myopic economic criteria" into the mechanism through which final firms select their production partners. Final firms follows this simple criterion: "take the best team of sub contracted firms available during every production cycle over time". The final firm behaves simply trying to "optimise" the relation of partnership. After a final firm has received a request of product by the market, it moves inside the system, searching for a team of sub contracted firms to organise a production chain. Such search for partners follows a mechanism able to classify possible partners within the system, and to select them according to their "best economic performance" outcomes. The "time horizons" of the interaction are based on "one-shot" schema. At the start of the production cycle, the memory of the firm is reset. The "final profit" emerging by a production chain (through values of "time compression" and "mrtc", mentioned above) is totally gained by the leading final firm, which takes advantage by its "interstitial" position, at the edge of district and market. At the end of the production cycle, the final firm returns to its sub contracted firms a profit equal to their product, and pockets the possible "final profit". The inter-firm relations within the prototype follow the classic ideas about "sub-contracting" relations, as though they were regulated by an "internal market of individual contracts" (Cavestro and Durieux 2000). The second experimental setting is called "reciprocally long-term bounded firms". It shows a schema of agent-based interactions which follows different criteria, in respect to the previous one. Into the mechanism through which a final firm selects its production partners, we introduce criteria based on "commitment" and co-operation. The "time horizons" of the interaction are enlarged. Now, the final firm keeps in memory the outcome of previous interactions and is able to identify its foregoing partners. Operations are as follows: if a chain produces a value of time compression which is the same as, or higher to the one of the foregoing cycle, then the leading final firm doesn't search for a new team of sub contracted firms but still interacts with the same team. In order to increase the technological compatibility amongst firms interacting along the chain, the final firm can allocate the 40 per cent of the "final profit" gained by the chain to their interacting sub contracted firms, transforming the "profit" in "back-propagating" distributed resources. Such resources become incentives to co-operate for firms involved in "recurring interactions" along the chains, and tools for creating commitment-based stable relations of partnership. In short, final firms compute functions of "collective intelligence", becoming a kind of chain-based technology policy makers (Cavestro and Durieux 2000). Here, the agglomeration of firms becomes an "integrated" district with a "structure of partnership amongst firms". the district "structure of partnership" shows higher economic performance of the firms, reduction of the strong selection caused by the market, the emergence of a dynamic of lock-in and lock-out of the chain corresponding with an inter-firm co-ordination between technological phases of exploration and exploitation; higher capacity for firms to calculate and to follow more rationally the sequential phases of learning (absorption, learning, saturation), and reduction of the impact of technological shocks (see figures 9 and10). Summarising the outcome of our first simulations, we can draw some first conclusions: what differs an aggregation of firms from an industrial district seems to be the structure of relations amongst firms, namely the form of interdependence and integration amongst firms. The economic performance of our localised firms grows with the emergence of stable mechanisms of co-ordination, which allows the system to process more correctly the "relevant" information coming from the external environment and to give rise to forms of "co-ordinated learning" (see for details: Boero and Squazzoni 2001). Experimental Settings: Options of "Local Institutional Engineering"
In this paper, we have experimented some options of "local institutional engineering" which are currently experimented in the empirical field. In the last years, there is a shift in the debates on the "institutional engineering", from a focus on the role of central and national states to a focus on regional and local policies, according to the idea that decentralised and localised organisational systems need decentralised and localised "institutional policies" (Hassink 1996). From the perspective of the "learning economy" (Lundvall 1999; Howells 1999), Lorenzen has recently classified some "policy means" which can describe the relation between local institutional engineering and economic performance within the so-called localised systems of production or industrial clusters. Starting from the idea that "particular institutional environments are seen to facilitate technological learning and economic growth", that "development includes a range of formal and informal local institutions [...] formal institutions encompass a variety of local organisations: associations, service-providers, schools and universities, and policy-making bodies [...] informal institutions span from firm-level or network-level routines to community-level norms and conventions, facilitating trust and economic co-ordination", he emphasises the "need for localised learning policies", where "policy-makers should take account of what goes on at the 'bottom': recognise firms as experimenting, learning organisations, and create a regional structural and institutional infrastructure that corresponds to their cognitive, behavioural, and strategic aspects of learning". He emphasises that "policy should leave room for experimentation and variety", because of the decentralised nature of the interactive learning. He describes different "policy means" for promoting firm-level learning (education and training), for supporting the "experimentation on existing firms", for promoting forms of interactive learning ("identifying particular activities about which firms may co-operate"), and for promoting knowledge centres and links to the outside environment, i.e., "providing technology transfer infrastructure", and so on (Lorenzen 2001). Glasmeier (1999) analyses the case of so-called "real service centres" in the industrial districts, to say some institutions that promote specific activities explicitly attempting to improve the competitiveness of the firms of a district, in respect to finance (advisory services for non-ordinary financial operations, such as financial restructuring, merger and acquisitions, leverage and management buy-out), promotion (quality certification, partner search), technology (assistance with in-house R&D activities, assistance to subcontracting with research institutions, technology benchmarking, brokerage), innovation in organisation and management (assistance in enterprise creation, logistical assistance, organisational consultancy), and communication (assistance to communication strategies, assistance in telecommunication network connections, implementation of electronic data interchange systems and programs). Bianchi (1990) describes the case of Tuscany, classifying different institutional policies related to the design of so-called "service centres" (real services, such as marketing, promotion, education, managerial consultancy), "innovation centres" (demand oriented), or "research centres" (R&D functions). Such kind of "institutional engineering" can be viewed as a set of "deliberate actions", undertaken by policy-makers and/or collective associations of firms, which aim to create some specific "localisation advantages" to firms and to "strengthen local specialisation profiles" of the system (Meyer-Stamer 1999; see also: Parri 1991). Usually, the literature on the relation between agents, institutions and economic systems, emphasises issues such as the role of the institutional "reinforcement" upon the strategies of firms, the capacity of institutions to generate "collective resources" for firms, or to focus on specific functions, such as R&D, technology transfer, marketing, other qualified services, educational training, and so on, which are not producible or unavailable on the basis of the single firm (David 1994; Nelson 1998; North 1990; You and Wilkinson 1994). One of the most well-known framework of "institutional engineering" within industrial districts is the "consortium", namely a "formal aggregation of firms and institutions" oriented to produce specific services to firms, allowing specific inter-firm economies of scale and scope, the achievement of the necessary "size" for designing, i.e., R & D projects, or for resorting specific professional competencies unavailable within the single firms, or within the whole system (Arrighetti and Seravalli 1999; Deperru 1996; Ricciardi, Besone and Debernardi 1999). The field of such kinds of "institutional action" goes from some simple "regulating tasks" to the specific design of goods or services, from "inside-out" functions (i.e., marketing, commercialisation) to "outside-in" functions (i.e., technology innovation and transfer). In the case of our prototype, we choose to focus on the so-called "outside-in" functions of "local institutional engineering", conceiving institutions focused on what Cohen and Levinthal (1990) called "interface functions" and "transfer functions". The first experimental setting shows the introduction of what could be called a "consortium of information". It means an institution able to monitor the evolution of the technology and market environment. Here, institutional supporting action works above all setting a field of incentives upholding agent-based experimentation paths, filtering the inputs of information coming from the environment, distributing them to insider firms, and strengthening the channels of co-ordination amongst them. Such institution aims to support the experimental activities undertaken by firms, to increase the availability and the circulation of the information coming from the environment, and to reduce (-20 per cent) the technology implementation costs, providing professional technology information or assistance. The support of such institution acts on the "InfoMatrix" and the "TechMatrix", monitoring the access to information and lowering the cost for the insider firms. Automatically since the first cycle of the simulation, the institutional insiders are the 50 per cent of agents in every class. The cost of institutional supporting action is distributed over the insiders during every cycle of simulation. Trying to filter the inputs coming from the environment and to transfer and diffuse them inside the cluster of insider firms, such institution aims to reinforce the "absorptive capacity" of the firms, reinforcing their capabilities to process information coming from the environment. Introducing such supporting institution, the structure of the information flow becomes: from market to institution, from institution to insiders (see Figure 7). We introduce a third axis of "proximity", together with the previous ones ("spatial" and "organisational"), called "institutional proximity", which regulates the relations amongst firms which are institutional insiders. 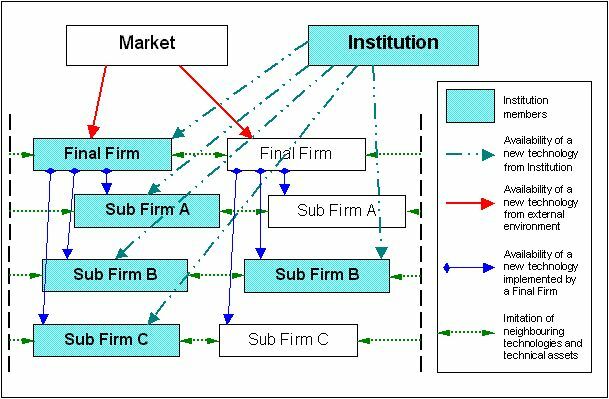 In fact, the institution creates an horizontal "sub-cluster" of firms, across the levels of the system. The institution creates more fluid channels of coordination amongst insider firms, reducing the cost of information and allowing the information coming from environment to circulate more quickly. Comparing to previous settings, here, in respect to final firms, we introduce a complete information and monitoring about the features of sub contracted firms which are institutional insiders. In respect to the sub contracted firms, we remove their "dependence of information" by the final firms. start of the technological exploration project. As in the previous case, since the start of the simulation cycles, the insiders are 50 firms for every class. The cost of the institutional action is distributed over all the insiders during every cycle of simulation, but the institutional action is made one time for all. The cost of activation of the technological research project is the cost of technology research regulated by the "InfoMatrix" mentioned above, multiplied by 40. When the fixed value of "technology saturation" is reached, and after the expected 40 cycles of "research fund", during which the institution accumulates the expected resources and enacts the research, the outcome of the institutional action comes to the insider firms. The advantages for insider firms are the possible discovery of T2 and T3 in advance in respect to market, and a reduction of technological and technical costs of change (-20 per cent). Undertaking such exploration activities, the possibility of success is fixed on the value of 30 per cent. The second institution covers more "active" and complex functions in respect to the previous one. The first institution (Institution 1) could be viewed as a set of "consulting services" able to monitor the technology and market environment within which the district acts, while the other (Institution 2) as a "technology centre" providing R&D and transfer activities focused on technology features of the specific industrial sector of the district, and providing consulting activities needed for firms. At this level, the main question is: are these qualitative differences relevant for improving the economic performance of the system? distribution of resources between insider and outsider firms. We have experimented separately with the institutions mentioned above on the two foregoing settings, trying to observe if the context of inter-firm relations within the district matters also for the outcome of the institutional settings. The outcome of the simulation in the case of Institution 1 on the "market-like district" is as follows: in respect to the simple "market-like district", a higher diffusion of technological information amongst the different classes of firms, a reduction of the asymmetry of information amongst firms, a reduction of the critical effect caused by phases of technological change, higher performance for firms, permanence of instability of production chains, and emergence of "positive externalities" for outsider firms. The supporting function of the institution allows a thick increase of the dynamics of technology absorption undertaken by firms and a reduction of the "domino effect" which characterises the "market-like district" (for details, see: Boero and Squazzoni 2001), with firms staying on the market also if under sub-optimal technological assets, and taking technological jumps during different times. The action of the institution allows the system to redefine the commanding times of the technology and market environment. If we look at the outcome, we can observe that the first technological shock is absorbed by the 78 per cent of firms, while the second has a reduced effect. At the end of simulation we have the 60 per cent of survivors, and almost the 30 per cent of them is made by outsider firms (see Figure 9). The technological shocks are damped and thinned out by the system. The differential of resources between insiders and outsiders is more and more growing up over time. The institutional supporting action allows firms to have paths of technological transition (from T1 to T2 and T3) more differentiated. As in previous "market-like district" setting, we have weak dynamics of stability into production chains (see Figure 10). The costs of co-ordination matter again, because of instability of production chains caused by the continuos mix of interactions between insider and outsider firms. Institutional effects imply a reduction of the "information overloading" which affects firms in the "market-like district", even if production chains are unstable. Even if less than in the first experimental setting ("market-like district"), the instability of the assets of relation amongst firms implies again an oscillating dynamic concerning the chain-based "aggregate" performance (see Figure 11). 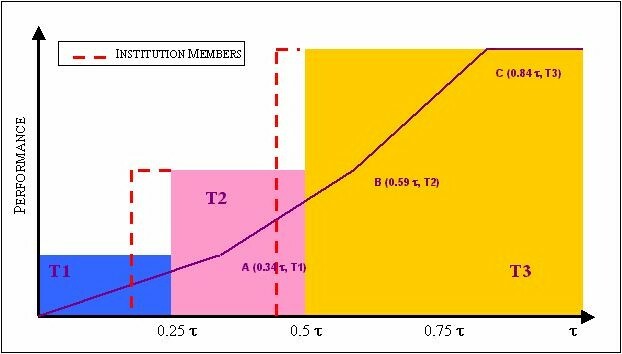 A it is shown in the Figure 12, at the level of difference of resources between insider and outsider firms, the benefit of the institution is clear since the beginning of the simulation cycles, but over time the cost of membership affects the level of resources of insider firms. The outcome of the simulation in the case of Institution 1 on the "partnership district" shows an increase of the capability of firms to find surviving paths. At the end of simulation, we have the 75 per cent of initial firms (see Figure 9). Every insider gets until the end of simulation. In respect to the previous case, the growth is stable and continuous during the simulation for the insider firms, while it is affected by oscillation for the outsiders. The emergence of stable production chains implies growing resources of technological adaptation coupled with low cost of co-ordination. The dynamic of lock-in and lock-out of the chain follows the phase of exploration and exploitation undertaken by firms (see Figure 10). The phases of technological discontinuity produce local but not macro instability within the district. The technological externalities, here, are managed by leading firms and transformed into resources for the "co-ordinated" learning of firms. This is possible because of the co-ordination of the investment choices undertaken by firms, which emerges by means of the stability of inter-firm relationships (see Figure 10). There is a higher stability of the "aggregated profit" outcome (see Figure 11). As it is shown in the Figure 12, the lock-in of interacting firms inside the institutional environment implies a different outcome concerning the distribution of resources amongst insider and outsider firms, in respect to the previous setting. Here, the cost of institution over time affect the distribution of resources amongst firms, but the stability of production chains, both inside and outside the institutional environment, and the general increasing of the learning capability of firms produce an equilibrated average of resources between insider and outsider firms. The outcome of the simulation in the case of Institution 2 on the "market-like district" shows phenomena similar to those of the previous setting (Institution 1 on the "market-like district"): high diffusion of technological information amongst different classes of firms, growing possibilities of adaptation to the external environment for firms, but for free riding outsiders too. At the end of simulation cycles, the level of survival is fixed at 60 per cent (see Figure 9). The discovery of T2 is anticipated from the 380 cycle. Over the phase of the general diffusion of T2 on the market, the 84 per cent of the firms have already implemented T2. The discovery of T3 is anticipated to 715 cycle. At 1525 all the surviving firms of the system have implemented T3. The system shows a dynamic of instability of inter-firm relation, connected to a high volatility of "aggregated profits" (see Figures 10 and 11). ). As it is shown in the Figure 12 and as in previous settings, the institutional support seems to affect the distribution of resources between insider and outsider firms, producing great advantages for insider firms. The last experimental setting concerns the introduction of the Institution 2 on the "partnership structure district". The outcome of simulation shows, above all, an increase of the capability of firm to find surviving paths. Institutional functions seem to affect highly the evolutionary path of our system. On the one hand, at the end of our simulation, we have 76 per cent of surviving firms (see Figure 9). On the other hand, because of emerging stability along the production chain amongst insider firms (see Figure 10), firms which are eliminated from market are made completely by outsider firms. All the insiders get until the end. Over the simulation, the economic performance is stable and continuous for insiders, while it is affected by continuos oscillation for outsiders. Because of the emergence of stable production chains, the technological absorption is distributed by the action of leadership of final firms through chains becoming strong channels of inter-firm co-ordination. The data about the chain-based "aggregate performance" show the importance of externalities managed by leading final firms which become tools for co-ordinating technology policies along the chains (see Figure 11). The discovery of T2 is anticipated to the 340 cycle, the one of T3 to the 675 cycle (see Figure 8). The phases of technological jumps are differentiated within the system (four phases). Comparing the different settings, it is possible to outline that, for the quality of the economic performance and the technological adaptation of firms over time, the structure of the relations amongst firms matters again. Institutions reduce the risk of transforming the "market-like" district into a "schizophrenic" microcosm unable to co-ordinate and to adapt to the environment. They allow to improve the capability of the district to redefine the commanding times of the standard evolution of the environment. They allow to mould the environmental framework of the actions of firms, with incentives, support to processing information, support to co-ordination, and generation of technological advantages. But, the problem of how firms can co-ordinate and learn depends again by the nature of their interactions. To take advantages by a "right" sequence of learning at the level of firms and by the co-ordination of the technological trajectories undertaken by firms involved into chains of interaction, it is needed production chains able to transform themselves, from a simple aggregation of firms to a tool of "mutual" learning. A stable context of interactions amongst firms is needed. Within an "integrated" system, such as the district, there is a deep "interdependence play" amongst firms, where the nature and the quality of the context of interaction, together with the capability of innovating firms to co-ordinate and drag their partners into a context of learning, matter more that anything else. The difference of institutional functions seems not so relevant. In a context of exogenous technological evolution and dependence of firms from the environment, such as that of our prototype, it seems sufficient a kind of "local institutional engineering" focused on functions of "filtering and supporting the processing information activities" undertaken by firms in an experimental way. Lastly, it is worth while to say that if one looks at the district both from the point of view of an "economic mainstream outlook", to say conceiving only "economic imperatives" driving action and economic mechanisms regulating inter-firm relations, and from the point of view of "mainstream economic geography", to say conceiving a district as a cluster of firms benefit each other by an "agglomeration effect", one tends to oversimplify or not much appreciate factors such as the "interdependence play" amongst firms, the role of relations amongst firms as mechanisms of "coordination", and the problem of how the dynamic structure of the inter-firm network can become or not a scaffold of so-called "learning by interaction" (Amin and Cohendet 2000; Nooteboom 2000; Staber 2001; Uzzi 1996; Whitford 2001). Here, our opinion is that it is needed a socio-economic approach to districts focused on the interplay between agents, interactions and mechanisms of variety and coordination. Figure 10. The number of stable production chains over time. On the left, all the experimental settings based on the "market-like district", while on the right, all the experimental settings based on the "partnership district". Top-down: at the first level, the outcome of the first two experimental settings; at the second level, the outcome of the experimental setting with "Institution 1"; at the third level, the experimental setting with "Institution 2"
In our intentions, the further development of the prototype needs to follow these two different but interrelated lines. The first one will be focused on the computational development of the prototype, trying to explore changes into the structure of the prototype, in order to find more deep theoretical insights. In this respect, we wish to introduce more formalised "cognitive schema" describing the behaviour of agents, a more dynamic structure of district, i.e., with options of "decentralisation" or "internalisation" of production chains, and deeper experimentation of the relation between institutions and agents, i.e., introducing not only supporting but also decision making institutions. Our first aim is to study the feedback relation between macro and micro levels of the prototype, starting from the idea that it is important to study the emergence of formal and informal institutions on the basis of the capacity of agents to reflect upon collective properties of the district (Conte 2000; Gilbert 1996), i.e., exploring the problem of the agent-based "trust" on the strength of the system and its effect on the modification of agent-based expectations and the elaboration of the risk. In this respect, we wish to translate our computational framework in a body of "simulative experiments" with a mix of human subjects and artificial agents, i.e., studying the relevance of different cognitive, computational and cultural elements in the decision making process of agents (see: Boero 2001, and the SWIEE software). The second one will be focused on some empirical outlets, trying some empirical foundations for our prototype, applying the prototype framework to some case-studies, i.e., collecting empirical data on options of "institutional engineering" within a "real" district, or empirical data on the economic relevance of different mechanisms of governance (market-based or network of partnership-based) for the adaptive strength of the district. As it is stressed in Boero and Squazzoni (2001), since we are referring to an industrial district prototype, we think that it is not feasible a standard analysis of parameters of our model. Because the prototype doesn't reproduce an identified empirical reality, or a specific and real industrial district, we cannot rely on empirical precise data, collected or collectable, to define the "right" value of our parameters. Our prototype is based on some common and general concepts used like fundamentals able to identify the theoretical category of the "industrial district". Trying to create an evolutionary "prototype" model, the problem concerning the exact value "per se" of a "sign" doesn't have a strong and bounding meaning taken by itself. For an analysis of the prototype parameters, focused above all on an explanation of the "logic relationship" amongst them, and for an explanation of the idea that such parameters are meaningful modelling variables, we refer to Boero and Squazzoni (2001). Here, we analyse some parameters concerning the experimental settings of "local institutional engineering" we have introduced on the prototype. First of all, we focus on the number of institution insiders at the beginning of the simulation. We chose to set it at the 50 per cent of the entire population of firms, trying explicitly to see the emergent behaviour performed by firms in a "well-balanced" district, studying also emerging dynamics between insider and outsider firms. Stressing such parameter, modifying it with variations of the 10 per cent of the value, no different results are generated by the model. Finally, we consider some parameters of the experimental settings already analysed in our previous paper (Boero and Squazzoni 2001). With respect to the emerging dynamics of the model, we didn't see a particular effect caused by changes into parameters. Concerning the variation of the percentage of survival firms, the following table shows how even big variations of our parameters don't affect more heavily than expected the simulation outcome. Such table shows the mean absolute value of percentage variation concerning firms still "on market" at the end of the simulation cycles. It is compared to the value that we obtained with values chosen for our statement of the parameters. It is evident that result variations are all smaller than the parameters' ones. Figure 13. Analysis of parameters. "M 3 and M 4 a" are Institution 1 and 2 on the "market-like district". "M3 and 4 b" are Institution 1 and 2 on the "partnership district"
Our work owes much to the support of the Department of Social Studies, Faculty of Economics, University of Brescia, Italy. Right from the start of the project, Giancarlo Provasi has enriched us with intuitions and ideas about the "design" of the prototype and the following artificial experiments. Moreover, we wish to thank Lorenzo Bordogna, Stefano Breschi, Giangiacomo Bravo, Marco Castellani, Guido Fioretti, David Lane, Franco Malerba, Luigi Orsenigo, Leonardo Parri, Igor Piotto, Roberto Serra, and Pietro Terna for some interesting discussions on our work. The support of Pietro Terna has been indispensable. Our prototype has been discussed in the following circumstances: workshop on "Systems, Governance and Knowledge inside Networking Firms" (17-18 May 2001, University of Padova, Italy) at the "WEHIA 2001", workshop on "Economics with Heterogeneous Interacting Agents" (University of Maastricht, the Netherlands, 7-9 June 2001), "Ecis Conference on the Future of the Innovation Studies" (University of Eindhoven, the Netherlands, 20-23 September 2001), workshop on "Simulation and Industrial Districts", Department of Economic Sciences "Giuseppe Prato", University of Turin, (21 October 2001), workshop on "Complexity and Industrial Districts", University of Modena and Reggio Emilia (5 December 2001), and workshop on "Experiments on a Computational Prototype of Industrial District", Cespri, Bocconi University, Milan (19 December 2001). In this respect, we wish to thank Fiorenza Belussi, Robin Cowan and Elad Harison, David Lane, Francesco Lissoni, Margherita Russo, Pietro Terna, and Bart Verspagen. 1 We have created our industrial district artificial prototype using Swarm libraries and Java programming language. Swarm is a toolkit for artificial simulation developed by Santa Fe Institute (see www.swarm.org). It is used by a growing community of social scientists. For descriptions and applications, see Terna (1998), Luna and Stefansson (2000); Luna and Perrone (2001). For an interesting application of Swarm to a model of industrial districts, see Fioretti (2001). Through agent-based rules of action, which define schedules and steps undertaken by firms during the execution of their computational processes, we have reproduced the body of all the "parametric relations" between firms and environment, and all the micro-mechanisms regulating the interactions amongst firms. As it is usual in all the object oriented programming languages, like Java, all these things have been translated into objects and messages through them. Using Swarm libraries, we have created all the classes of agents, the arrays regulating their positions within the system, and so on. Using a "Rule Master" function, according to the original idea of Pietro Terna and Nigel Gilbert (see the ERA Scheme in Gilbert and Terna 2000), we have separated the actions of agents from the rules of behavior, improving the control about processes within the model. Inside the "Swarm Model", we have implemented all the connections amongst objects and functions, and all the paths which regulate the action of the objects. Inside the "Observer Swarm", we have introduced all the control processes concerning the action of the model in order to produce all the data and graphs needed. To download Swarm, see: <http://www.swarm.org>. To download our computational codes, see: <http://www.eco.unibs.it/segdss/dss/squazzoni.htm>. 2 We can taxonomically assume that the difference between an industrial district and a more general industrial cluster, or a network of geographically agglomerating firms, is that the self-organising dynamics of the first one are based on long-term interactions and vertical and horizontal complex connections amongst spatially located firms, working into the same space of the segmentation of the market, and give rising to an high integrated production system. This is the reason why we speak about an industrial district, rather than about a more generic kind of industrial cluster. Another statement is that our prototype refers to a traditional picture of industrial district, to say a network of firms working into traditional industrial sectors (for example, not a high-technology production cluster) and within an environment not characterised by the proximity of universities or scientific research institutions devoted to R&D activities (for example, the famous case of Silicon Valley). 3 Ideas about the difference between "radical" and "incremental" paths of innovation, and related strategies of "exploration" and "exploitation", derive from evolutionary economics literature. For example, see: Antonelli (1995); Dosi (2000); Dosi and Nelson (1996); March (1991); Caccomo (1996); Marengo and Willinger (1997); Nooteboom (1999). ALBINO V, GARAVELLI A C, SCHIUMA G (1999), Knowledge Transfer and Inter-Firm Relationships in Industrial Districts: The Role of the Leader Firm, Technovation, 19. pp. 53-63. AMIN A and COHENDET P (2000), Organisational Learning and Governance through Embedded Practices, Journal of Management and Governance, 4, 1/2. pp. 93-116. ANDERSON P W, ARROW K, PINES D. (1988) (Eds. ), The Economy as an Evolving Complex System, Santa Fe Institute on the Sciences of Complexity, Addison- Wesley. ANTONELLI C (1995), The Economics of Localized Technological Change and Industrial Dynamics, Kluwer Academic Press, Boston. ARRIGHETTI A and SERAVALLI G (Eds.) (1999), Istituzioni intermedie e sviluppo locale, Donzelli, Rome, Italy. ARTHUR B W (1994), Increasing Returns and Path Dependence in Economics, Michigan Press. ARTHUR B W, DURLAUF S N, LANE D (Eds.) (1997), The Economy as an Evolving Complex System II, Santa Fe Institute on the Sciences of Complexity, Addison- Wesley. AUYANG S Y (1998), Foundations of Complex- System Theories in Economics, Evolutionary Biology, and Statistical Physics, Cambridge University Press. AXELROD R (1997), The Complexity of Cooperation. Agent-Based Models of Competition and Cooperation, Princeton University Press, Princeton, New Jersey. AXTELL R (2000), Why Agents? On the Varied Motivations for Agents Computing in the Social Sciences, Center for Social and Economic Dynamics, Working Paper No. 17. BALLOT G AND TAYMAZ E (1997), The Dynamics of Firms in a Micro-to-Macro Model: The Role of Training, Learning and Innovations, Journal of Evolutionary Economics, 7, 4. pp. 425-457. BELUSSI F (1996), Local Systems, Industrial Districts and Institutional Networks: Towards a New Evolutionary Paradigm of Industrial Economies, European Planning Studies, 4. pp. 1-15. BELUSSI F and GOTTARDI G (Eds.) 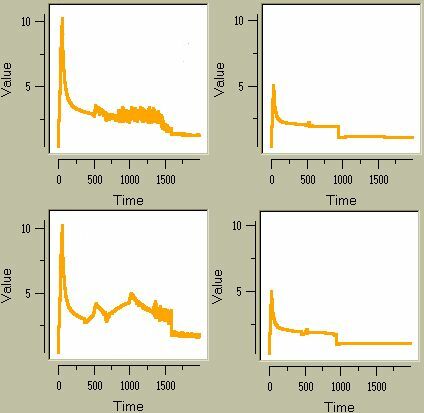 (2000), Evolutionary Patterns of Local Industrial Systems. Towards a Cognitive Approach to the Industrial District, Ashgate, Aldershot Brookfield Singapore Sydney. BIANCHI P (1990), Innovating in the Local Systems of Small and Medium Sized Enterprises: The Experience of Tuscany, Entrepreneurship & Regional Development, 2. pp. 57-69. BIANCHI P and GIORDANI M G (1993), Innovation Policy at the Local Level and at the National Level. The Case of Emilia-Romagna, European Planning Studies, Vol. 1, No. 1. pp. 25-41. BOERO R (2001), "SWIEE- A Swarm Web Interface for Experimental Economics", in Luna F and Perrone A (Eds. ), Agent-Based Methods in Economics and Finance: Simulations in Swarm, Kluver Academic Publishers, Boston/Dordrecht/London. pp. 87-107. 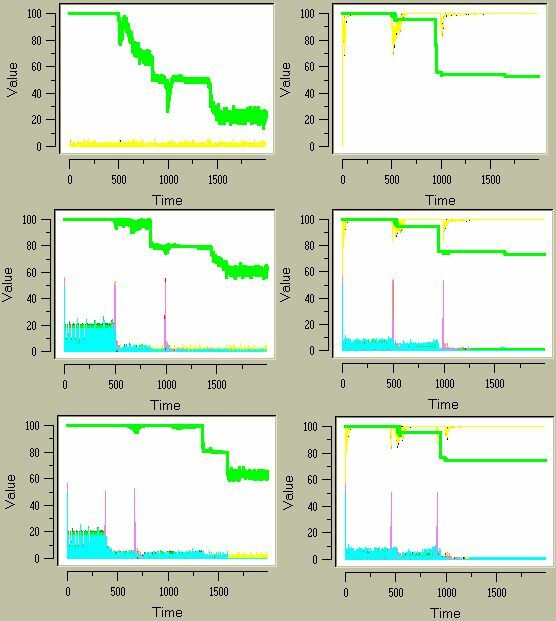 BRENNER T (2001), Simulating the Evolution of Localized Industrial Clusters- An Identification of the Basic Mechanisms, Journal of Artificial Societies and Social Simulation, vol.4, no.3 <http://www.soc.surrey.ac.uk/jasss/4/3/4.html>. CACCOMO J - L (1996), Technological Evolution and Economic Instability: Theoretical Simulations, Journal of Evolutionary Economics, 6, 2. pp. 141-155. CARLSSON B (1994), "Technological Systems and Economic Performance", in Dodgson M and Rothwell R (Eds. ), The Handbook of Industrial Innovation, Edgar Publishing Company, Vermont Brookfield. pp. 13-24. CARLSSON B, ELIASSON G, and TAYMAZ E (1997), "Micro-Macro Simulation of Technological Systems: Economic Effects of Spillovers", in Carlsson B (eds), Technological Systems and Industrial Dynamics, Kluwer Academic Publishers, Boston. pp. 255-278. CAVESTRO W, and DURIEUX C (2000), Firmes, réseaux et apprentissage, in Économie et Sociétés, Séries F, 37, 9. pp. 87-100. COHEN W, and LEVINTHAL D (1990), Absorptive Capacity: A New Perspective on Learning and Innovation, Administrative Science Quarterly, 35. pp. 128-152. CONTE R (2000) The Necessity of Intelligent Agents in Social Simulation, in Ballot G, Weisbuch G (Eds. ), Applications of Simulation to Social Sciences, Hermes Science Publishing Ltd, Oxford. pp. 19-38. COOKE P and MORGAN K (1998), The Associational Economy. Firms, Regions, and Innovation, Oxford University Press, New York. DAVID P (1994), Why are Institution the 'Carriers of History'? : Path Dependence and the Evolution of Conventions, Organizations and Institutions, Structural Change and Economic Dynamics, vol. 5, no. 2. pp. 205-220. DEI OTTATI G (1994), Co-operation and Competition in the Industrial Districts as an Organizational Model, in European Planning Studies, No. 4. DEPERRU D (1996), Economia dei consorzi tra imprese, EGEA, Milan. DOSI G (2000), Innovation, Organization and Economic Dynamics. Selected Essays, Edward Elgar, Cheltelham, UK, Northampton, MA, USA. DOSI G and NELSON R (1996), An Introduction to Evolutionary Theories in Economics, Journal of Evolutionary Economics, 4, 2. pp. 153-172. DURLAUF S N and YOUNG P H (Eds.) (2001), Social Dynamics, The MIT Press, Cambridge, Massachusetts. ELIASSON G (1991), Modeling the Experimentally Organized Economy. Complex Dynamics in an Empirical Micro-Macro Model of Endogenous Economic Growth, Journal of Economic Behavior and Organization, 16. pp. 153-182. EPSTEIN J M and AXTELL R (1996), Growing Artificial Societies from the Bottom-Up, MIT Press, Cambridge, Massachusetts. GILBERT N (1996) Holism, Individualism and Emergent Properties. An Approach from the Perspective of Simulation, in Hegselmann R, Mueller U and Troiztsch K G (Eds. ), Modelling and Simulation in the Social Sciences from the Philosophy of Science Point of View, Kluwer Academic Publishers, Dordrecht / Boston / London. pp. 1-27. GILBERT N and DORAN J (Eds.) (1994), Simulating Societies. The Computer Simulation of Social Phenomena, UCL Press, London. GILBERT N and TERNA P (2000), How to Build and Use Agent-Based Models in Social Science, Mind & Society, I, 1. pp. 57-72. GLASMEIER A K (1999), Territory-based Regional Development Policy and Planning in a Learning Economy: The Case of 'Real Service Centers" in Industrial Districts, European Urban and Regional Studies, Vol. 6, No.1. pp. 73-84. HASSINK R (1996), Technology Transfer Agencies and Regional Economic Development, European Planning Studies, Vol. 4, Issue 2. HOLLAND J H (1995), Hidden Order. How Adaptation Builds Complexity, Perseus Books, Cambridge, Massachusetts. HOLLAND J H (1998), Emergence from Chaos to Order, Perseus Books, Cambridge, Massachusetts. HOWELLS J (1999), "Regional Systems of Innovation? ", in Archibugi D, Howells J, and Michie J (Eds. ), 1999, Innovation Systems and Policy in a Global Economy, Cambridge University Press. pp. 67-93. LANE D (1993), Artificial World and Economics, Part II, Journal of Evolutionary Economics, 3, 3. pp. 177-197. LANE D (2001), Complexity and Local Interactions: Towards a Theory of Industrial Districts, Paper presented to the conference "Complexity and Industrial Districts", Montedison Foundation, Milan, Italy, June 2001. LISSONI F (2001), Knowledge Codification and the Geography of Innovation: The Case of Brescia Mechanical Cluster, Research Policy 30, forthcoming. LAZERSON M H and LORENZONI G (1999), The Firms that Feed Industrial Districts: A Return to the Italian Source, Industrial and Corporate Change, vol. 8, N. 2. LORENZEN M (2001), Localized Learning and Policy: Academic Advice on Enhancing Regional Competitiveness through Learning, European Planning Studies, Vol. 9, No. 2. LUNA F and PERRONE A (Eds.) (2001), Agent-Based Methods in Economics and Finance: Simulations in Swarm, Kluver Academic Publishers, Boston/Dordrecht/London. LUNA F and STEFANSSON B (Eds.) (2000), Economic Simulations in Swarm: Agent- Based Modeling and Object Oriented Programming, Kluver Academic Publishers, Boston/Dordrecht/London. LUNDVALL B- K (1999), "Technology Policy in the Learning Economy", in Archibugi D, Howells J, and Michie J (Eds. ), 1999, Innovation Systems and Policy in a Global Economy, Cambridge University Press. pp. 19-34. MALMBERG A and MASKELL P (1997), Towards an Explanation of Regional Specialization and Industry Agglomeration, European Planning Studies, Vol. 5, Issue 1. MARCH J G (1991), Exploration and Exploitation in Organizational Learning, Organization Science, 2, 1. pp. 71-87. MARENGO L, WILLINGER M (1997), Alternative Methodologies for Modeling Evolutionary Dynamics: An Introduction, Journal of Evolutionary Economics, 7, 4. pp. 331-338. MEYER-STAMER J M (1999), From Industrial Policy to Regional and Local Location Policy: Experience from Santa Caterina/Brazil, Bulletin Latin American Research, Vol. 18, No. 4. pp. 451-468. NELSON R R (1998), "The Co-Evolution of Technology, Industrial Structure, and Supporting Institutions", in Dosi G, Teece D J, and Chytry J (Eds. ), Technology, Organization, and Competitiveness. Perspectives on Industrial and Corporate Change, Oxford University Press, New York. pp. 319- 335. NOOTEBOOM B (1999), Learning, Innovation and Industrial Organization, Cambridge Journal of Economics, 2. pp. 127-150. NOOTEBOOM B (2000), Learning by Interaction, Absorptive Capacity and Governance, Journal of Management and Governance, 4, 1/2. pp. 69-92. NORTH D C (1990), Institutions, Institutional Change, and Economic Performance, Cambridge University Press, Cambridge. PARRI L (1991), Politiche regionali per l'innovazione tecnologica: Rhône-Alpes ed Emilia Romagna, Stato e Mercato, 31. pp. 77-115. PILOTTI I (2000), Networking, Strategic Positioning and Creative Knowledge in Industrial Districts, Human System Management, 19. pp. 121-133. RICCIARDI C A, BESONE A and DEBERNARDI M C (1999), "Le relazioni interorganizzative tra PMI: dal rapporto di fornitura alla partnership strategica", in ISTUD (Eds. ), Le discontinuità nello sviluppo delle piccole imprese, Il Sole24ore, Milan, Italy. pp. 141-188. SIGNORINI F L (Eds.) (2000), Lo sviluppo locale. Un'indagine della Banca d'Italia sui distretti industriali, Donzelli, Rome. pp. XIII- XL. STABER U (2001), The Structure of Networks in Industrial Districts, International Journal of Urban and Regional Research, Vol. 25.3. pp. 537-552. 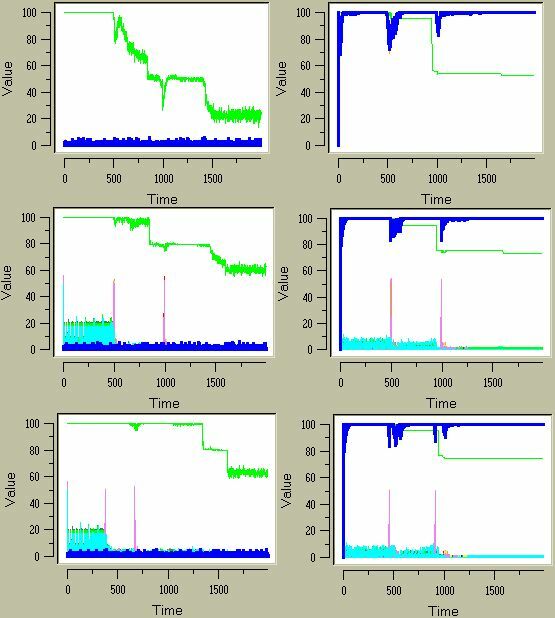 TERNA P (1998), Simulation Tools for Social Scientists: Building Agent Based Models with Swarm, Journal of Artificial Societies and Social Simulation, vol. 1, 2. <http://www.soc.surrey.ac.uk/jasss/1/2/4.html>. TERNA P (2001), Creating Artificial Worlds: A Note on Sugarscape and Two Comments, Journal of Artificial Societies and Social Simulation, vol. 4, no.2. < http://www.soc.surrey.ac.uk/jasss/4/2/9.html>. TULZEMANN VON G N (2000), Technology Generation, Technology Use and Economic Growth, European Review of Economic History, 4. pp. 121-146. UZZI B (1996), The Sources and Consequences of Embeddedness for the Economic Performance of Organizations: The Network Effect, American Sociological Review, vol. 61. pp. 674-698. VERSPAGEN B (2001), Economic Growth and Technological Change: An Evolutionary Interpretation, Directorate for Science, Technology and Industry, OECD, Working Paper 2001/1. WHITFORD J (2001), The Decline of a Model? Challenge and Response in the Italian Industrial Districts, Economy and Society, vol. 30, No. 1. pp. 38-65. YOU J- I and WILKINSON F (1994), Competition and Cooperation. Towards Understanding Industrial Districts, Review of Political Economy, 6, 3. pp. 259-278.